Nardwuar The Human Serviette News: Thanks MTV for nominating Nardwuar.com for an "O Music Award" ! Thanks MTV for nominating Nardwuar.com for an "O Music Award" ! 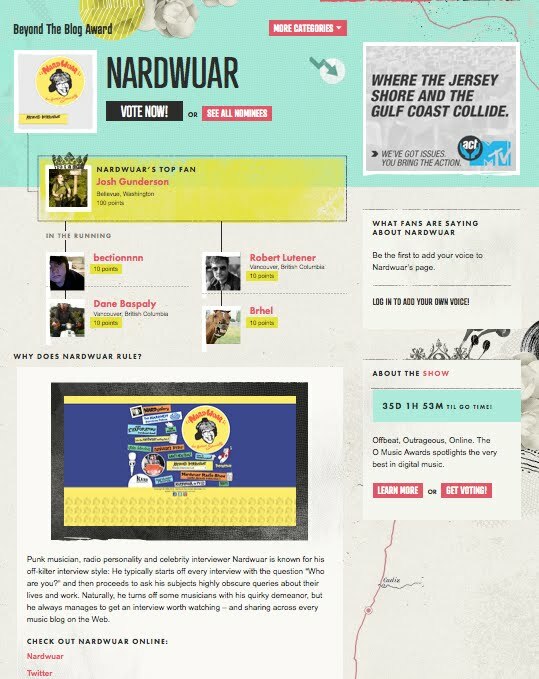 Thanks MTV for nominating Nardwuar.com for an "O Music Award" in the "Beyond The Blog" category! You can vote for Nardwuar.com HERE ! 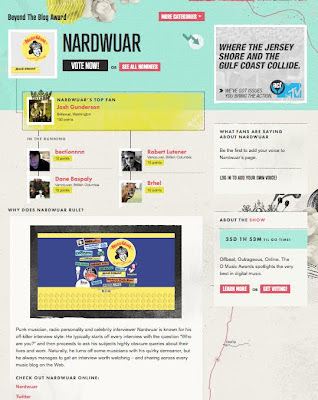 Nardwuar.com has been on thee web since 1996 through the kind help of Richard, Larry, Leora, Tom, Mint Records, Cup, Miek, the Vancouver Film School and many others! Doot doola doot doo ... doot doo!